E outra receita desas saudábels que tanto nos gustan e que veñen moi ben para os días de verán, pois se fan moi axiña e os ingredientes están no seu punto óptimo. A min como máis me gusta o pisto é cun ovo fritido, o sabor da xema quédalle de vicio. Imos aló! 1. Cortamos tódalas verduras en cadradiños, fritímolas e salgamos. 2. Cando xa case estean a punto, engadimos o prebe de tomate ou o tomate relado e fritimos un chisco máis. 3. Fritimos os ovos cun belisco de sal, poñémolos enriba do pisto e listo! Os ingredientes poden variar, hai quen non usa pementos ou quen usa só pementos e prebe de tomate. Iso xa, a gustos! E se tendes pemento amarelo, tamén quedará moi ben e daralle un toque de cor que o fará máis apetecíbel. Como tamén está moi bo é nunha torrada con queixo relado e gratinado por riba. Unha receita de sempre que se fai nun plis e coa que de seguro pasaremos pan polo prato 😉 Bo proveito! This recipe is one of our favourite healthy recipes, especially in summer when its ingredients are in season. 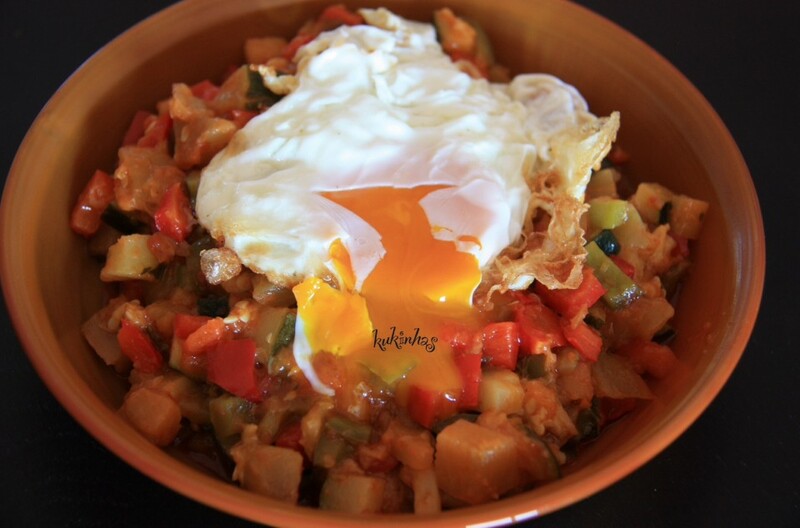 I love it with a fried egg on top, the fried egg yolk matched perfectly with the veggies. Let’s go! 1. 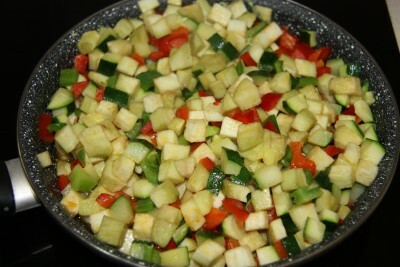 Cut all veggies into little squares and fry them. Salt. 2. 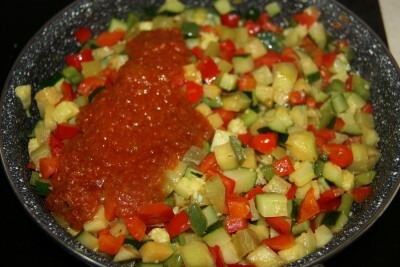 When veggies are almost done, add tomato sauce or grated tomato and fry for a while. 3. 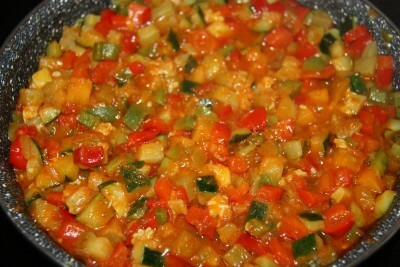 Fry eggs with a pinch of salt and place it on top of the ratatouille! And that’s it! Ingredients may vary depending on where it’s done or your own choice, in some parts only peppers are used, and sometimes no peppers at all. If you happen to have some yellow bell pepper, use it as well. You can put ratatouille on toasted bread and then grill some grated cheese on top of it. It’s delicious! This traditional recipe will be tasty no matter the veggies you use. Enjoy!